Perennial herb from a taproot; stems erect, usually simple, narrow-winged, lightly hairy, 30-80 cm tall. Basal and lower to middle stem leaves broadly lanceolate, entire, the bases winged and continuous with the stems, lightly woolly below, nearly glabrous above, reduced upwards. 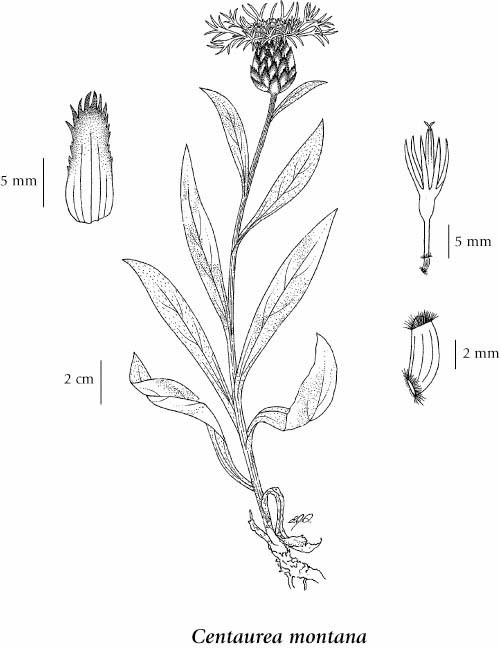 Heads discoid, solitary on the stems; involucres 20-25 mm tall, 12-15 mm wide; involucral bracts egg-shaped to narrowly egg-shaped, glabrous, with dark brown or black, tattered margins towards the apex; disk flowers blue, rarely white, the sterile marginal ones 40-45 mm long, enlarged at the tips with five lobes, the central perfect ones about 16 mm long. Achenes light yellow, glossy, 5-6 mm long; pappus about 0.5 mm long. Mesic roadsides and waste places in the lowland zone; infrequent in SW BC, known from S Vancouver Island and the adjacent mainland; introduced from Europe. 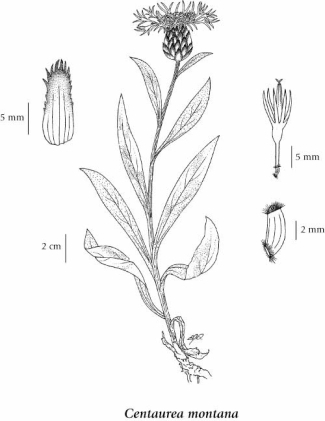 Centaurea montana var. alba hort.